The moral urgency of the present moment cannot be overstated. We seek to make rapid progress to advance the Grand Strategy and enable a truly representative democracy to take swift action on climate change, wealth and income inequality, immigration, incarceration, healthcare, education, and so much more. But we also recognize the ambitious nature of this strategy and that building a mass movement of civil resistance can take time. Therefore, there are two possible timelines built into the strategy: one that culminates in 2019 and another that stretches until 2021. 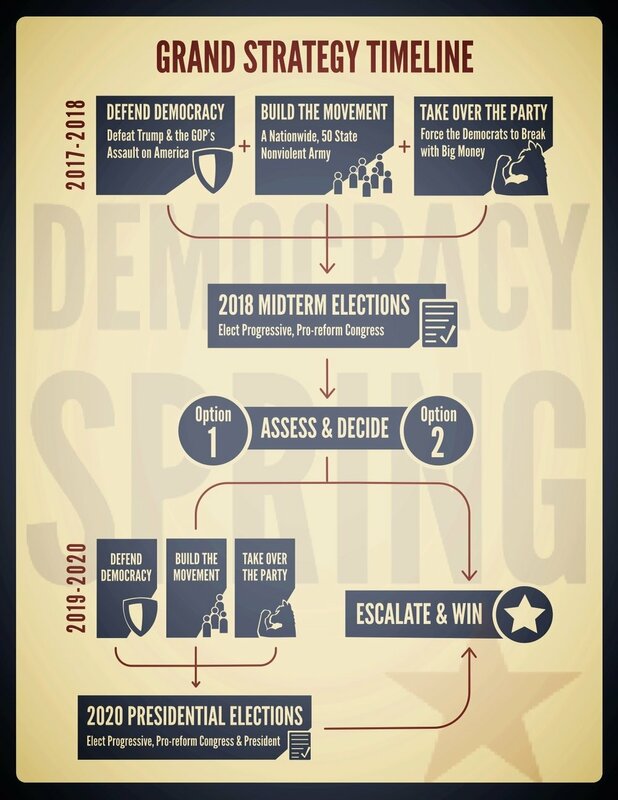 The decision of whether or not to push for a national and sustained escalation coming out of the 2018 midterm elections will depend on how many seats we pick up with pro-reform progressive candidates and the internal strength of our movement. Weighing these two variables, we will assess and decide whether to push for reform in 2019 or continue to build power in preparation for the 2020 election and our subsequent escalation to pass reform.